The federal Rural Energy for America Program (REAP) has helped farms and rural small businesses build more than 1,200 renewable energy projects across the country. But now it’s under serious threat. The program will expire unless Congress includes funding for this popular, bipartisan program in the current Farm Bill, a sprawling piece of legislation that encompasses everything from food assistance to conservation. The Senate and House both passed versions of the Farm Bill at the end of June. The Senate version includes funding for REAP. The House version does not. That means the bills now go to a conference committee made up of representatives from both bodies, to determine if the final bill includes REAP funding or not—among other differences between the bills that must be reconciled. Both chambers will then need to vote on the final bill. “The REAP program was a deciding factor,” said Tommye Rafes, who went solar as part of Solar United Neighbors’ Lewisburg Solar Co-op in 2017. 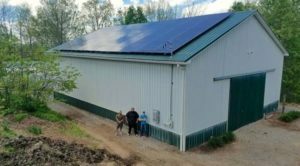 She and her husband Richard installed a 21kW system on their farm in West Virginia with the help of a grant from the REAP program. She estimates the system will pay for itself within about six years. Renewable energy and energy efficiency assistance programs like REAP account for less than one-tenth of one percent of Farm Bill spending. But they have an outsized impact in parts of our country that need an economic boost and clean energy. Since 2009, REAP has provided hundreds of millions of dollars in grants and loan guarantees, supporting small town economic development, good jobs, and energy independence. The Rafes’ solar barn in West Virginia. “This could be an answer to more rural businesses trying to stay in business,” said Debby Kay of Chilbrook Kennels in Harpers Ferry, West Virginia. Kay recently used REAP funding to add solar and battery storage to her business. Kay noted that energy costs account for a significant chunk of her business’ bottom line. By going solar with battery storage, the business can cut its electric bill and keep on the lights even when the grid is down—a big benefit for rural businesses where the grid is less reliable. Solar installers also have seen the benefits of the program. “REAP drastically changes the economics for small rural businesses looking to go solar,” said Michael Collins from Power Production Management in Florida (which served the Alachua County Solar Co-op). He said REAP has been an important tool for his company to deploy rural projects. Congress will be debating the Farm Bill that emerges from the conference committee soon, so it’s urgent to tell your Congressional representatives to include full mandatory funding for the REAP program. You can act now by using our form to contact your representative today! Solar supporters across the country must make our voices heard to protect this important program for expanding solar access and boosting local economies in rural America!